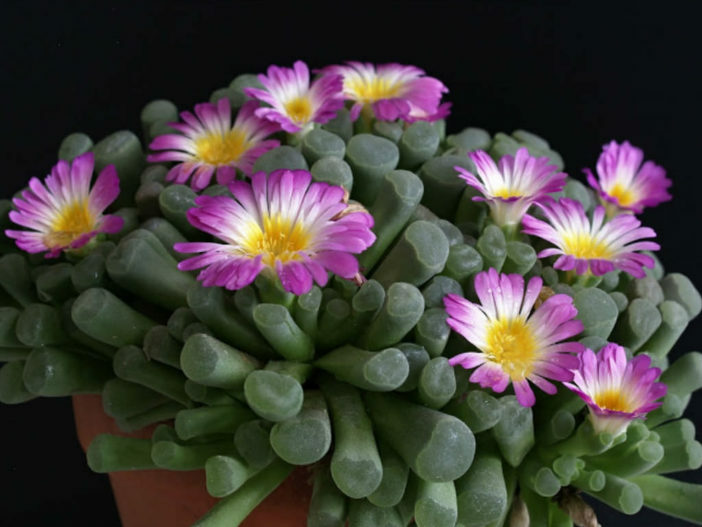 Frithia are low-growing evergreen succulent perennials with erect, club-shaped leaves with a clear window at the apex, and solitary, daisy-like red to purple flowers in late winter. The genus Frithia was established by N.E. Brown (1925), a taxonomist based at Kew Herbarium. At that stage no species were assigned to this genus and only later was a full description of Frithia pulchra given (Brown 1926). It was named after Frank Frith (1872 – 1954), a railway services gardener stationed at Park Station, Johannesburg, who took the specimens to Brown at Kew while on a visit to London. Brown named Frithia in honour of the man who brought him the specimens. The specific epithet “pulchra” is derived from the Latin “pulcher” meaning beautiful. Light: The plant will take as much light as you can give it, but fierce sunshine could “scorch” the plant. In habitat the plant overcomes this problem by only having the leaf tips showing above the ground. Soil: An open compost is essential and if the only pot available is a deep one fill the bottom half with coarse grit or gravel. Water: Frithia is not shy of water and should be watered regularly during the growing season, but the water must be able to drain away quickly. Keep the plant dry in winter. Fertilizer: When in growth feed every two or three weeks with a low nitrogen liquid fertilizer. Frithia is a summer grower and relatively easy to cultivate. It need light sporadic watering during its winter resting period and requires moderate sprinkling in summer as it is rot prone if kept too moist when the heat turns off its growth cycle. Gritty, well drained soil, containing a small amount of organic material will keep this species happy. Frithia can be grown in pots or out of doors in a rockery. Soak the compost fully but allow it to dry out perfectly between waterings. Under-watering can lead to disastrous results, so be generous with water in summer. Nearly all problems occur as a result of overwatering and poor ventilation, especially when weather conditions are dull and cool or very humid. Keep dry in the winter. It does well in full blazing sun, as well as whit some shade in summer. Frithias can be sown from seed sown in a gritty sandstone medium or propagated vegetatively by division.